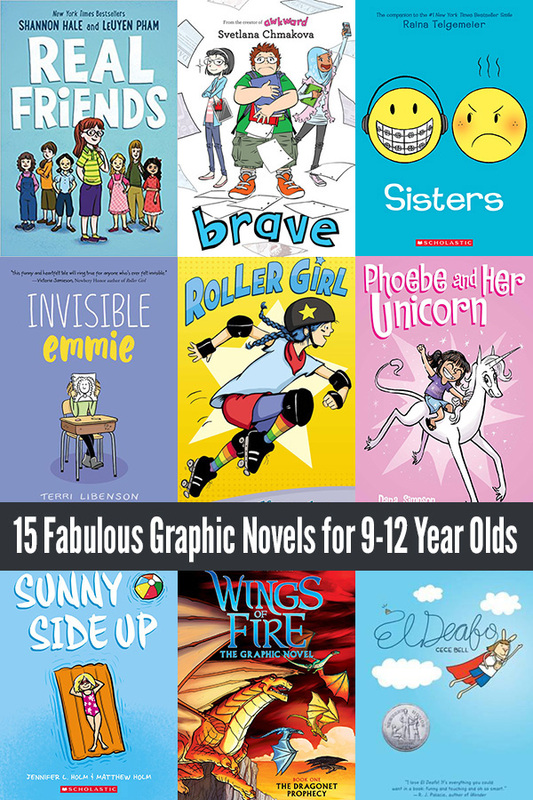 In the world of kids books, graphic novels are so hot right now. For the unfamiliar, graphic novels are book length stories told with the visual support of a comic strip format. 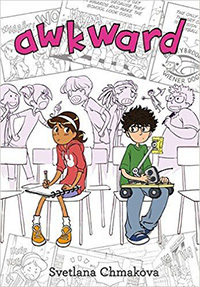 They include fun visual elements and provide interesting ways for kids to interact with different text features, and thanks to the recent publication of titles by a fabulous collection of tween/middle school focused graphic novel authors, they are also great for inviting discussion around important themes and topics relevant to the 9-12 year old age group. My ten year old is a big fan of graphic novels. 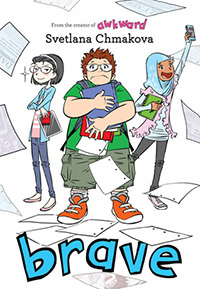 She is a confident reader and a voracious consumer of all different genres of books, so while graphic novels are great for supporting struggling readers – the visuals providing important contextual support to help the reader decipher text and meaning – they are attractive to tweens within a vast range of reading levels. 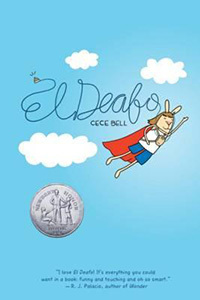 El Deafo is the fabulous (semi-autobiographical) story of Cece as she adjusts to life as a deaf person, and find ways to cope as the only deaf student in her school – a job made especially difficult thanks to the giant hearing aid strapped to Cece’s chest! It’s funny, enlightening and a fabulous lesson in learning to accept individual differences. 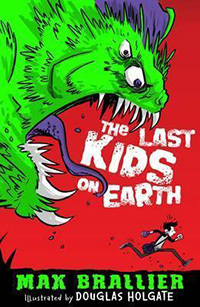 The Last Kids on Earth tells the hilarious story of Jack and two friends, Quint and June, as they survive the aftermath of a monster apocalypse – hiding out in a super cool treehouse! This is book one in a soon-to-be four book series. 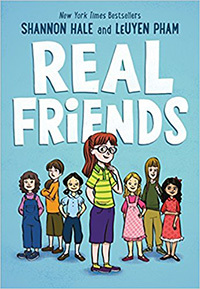 Real Friends is the semi-autobiographical story making friends and losing them, exploring the complex nature of playground politics amongst primary/elementary aged girls. 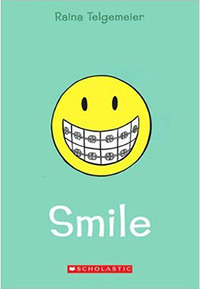 Smile is the often touching, sometimes funny, story of Raina who accidentally knocks out her front teeth in sixth grade and the heartbreaking four year dental ordeal that follows as her teeth are repaired. Includes important messages about true friendship, being brave and standing up for oneself. 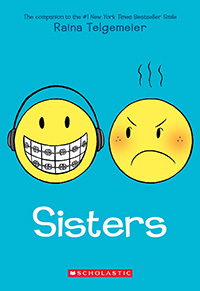 Sisters is the story of sisters, Raina and Amara. Raina used to beg her parents for a younger sister and one day she finally got her wish. But, from almost day one, the two are polar opposites and do not get along very well. An endearing story of sibling rivalry, parental conflict, and learning to find common ground. 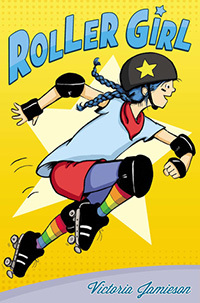 Roller Girl has so much good stuff in it – it explores growing apart from childhood friends, finding new friends, standing up for yourself and others, the importance of positive role models, defining who you are as a person as you grow up, facing fear and surviving. Awkward is a great story about a diverse group of kids who must learn to work together. It offers a fabulous reminder to be open to others, even when they are completely different to you, because they may just be more similar than you realise. 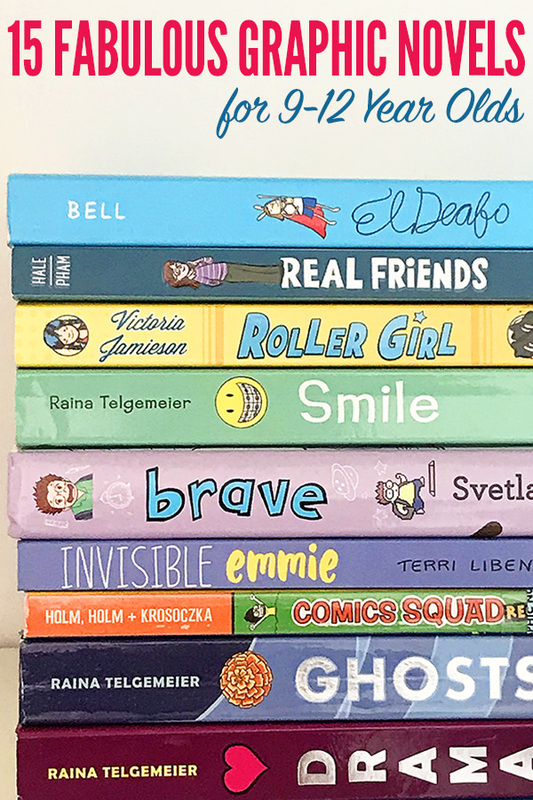 Like Awkward, Brave introduces a diverse range of middle school characters in a wonderful story exploring bullying, standing up for yourself and finding a place where you belong. The main character, Jensen, is the victim of bullying. He’s likeable and relatable and ultimately, brave. 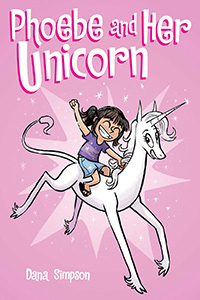 Phoebe and Her Unicorn is the first in a series of witty, sarcastic stories about 9 year old Phoebe, a confident, happy misfit, and her self-absorbed unicorn pet, Marigold Heavenly Nostrils. The series explores themes related to fitting in, popularity, loneliness, honesty and being oneself. Drama is about embracing what you love, courage and dedication. 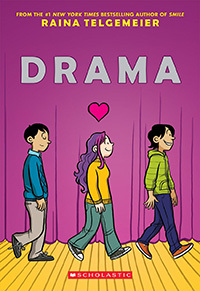 It shares the story of Callie – a seventh grader who loves the theatre, and the work, friendships, crushes and drama that develop backstage during the school musical production. 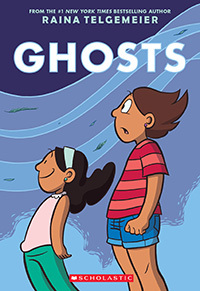 Ghosts is an insightful and hopeful story that despite focusing on some heavy themes – family illness, moving away from school and friends, the Day of the Dead celebration, reminds us that there is always a bright side, even in the most dire of circumstances. 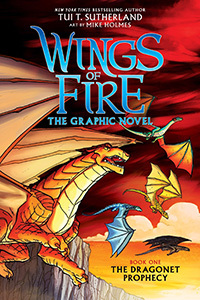 Miss 10 loves the Wings of Fire book series and was excited to discover the first book now published in graphic novel format. Told from the perspective of one of five young dragons destined in a prophecy to end the war for a new leader between the seven dragon tribes, this is a fabulous story about taking back control of one’s own destiny in an exciting fight for freedom. 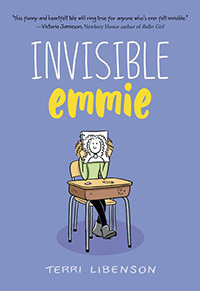 Invisible Emmie by Terri Libenson. Told from the perspective of two totally different girls – Emmie who is quiet, shy and artistic and Katie who is popular, outgoing and athletic. This is the story of a not-so-ordinary school day when Emmie is pushed into the spotlight thanks to an embarrassing situation, and what happens when the lives of these two girls unexpectedly intersect. Positively Izzy is about the labels we are given at school. 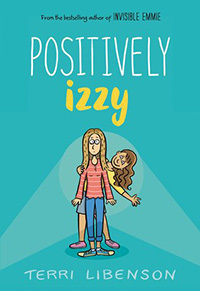 Izzy is the dreamer, Bri is the brain, and both girls are dealing with insecurity over the upcoming school talent show. Can they burst out from behind the labels they have been given to be better understood by others? 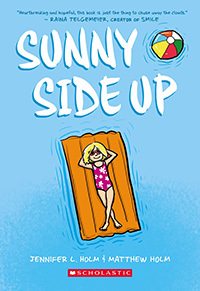 Sunny Side Up is about the summer 10 year old Sunny is spent to stay with her grandfather in Florida – in a retirement community while her parents deal with her teenage brother’s substance abuse problem. It is so boring until Sunny strikes up a friendship with the gardener’s son, Buzz. Sunny and Buzz enjoy adventures together and Sunny learns that it’s often not good to keep secrets and that her brother’s struggles are not her fault. Check out our bookshelf for more of the Best Books for Kids across a range of ages, stages and themes.